One of my new year’s resolutions was to eat better and include more vegetables in my family’s diet. Of course, that is easier said than done especially when you are a busy work at home mom like me. I always preferred dishes that were easy to make so I didn’t have to spend too much time in the kitchen preparing meals. Let’s face it- it takes a lot of prep work to make veggie side dishes. Between the washing, cutting, slicing, peeling, dicing, etc, you can spend up to an hour preparing simple side dishes of vegetables! For me, the faster I can get dinner prepared and served, the better. I picked up the Yukon Gold and Mushroom Medley at my local grocery store to try out. 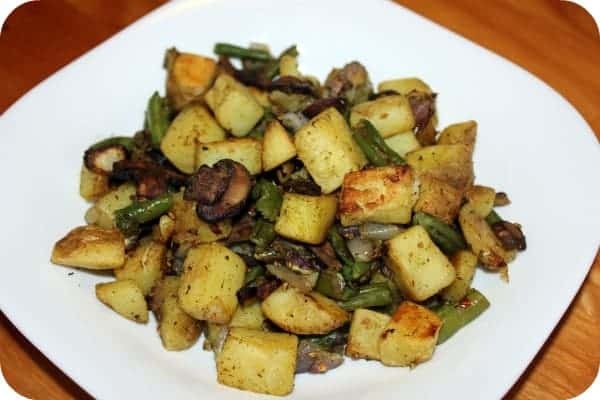 It’s made up of specially selected Yukon Gold potatoes, green beans, crimini mushrooms, fire roasted crimini mushrooms and red onions with a seasoning blend of roasted garlic, rosemary, thyme, and sea salt. They are also trans fat-free, low in fat with no artificial flavours or colours. There’s two ways you can cook the medley: stove top or oven. I decided to use the oven method because I love roasted veggies. 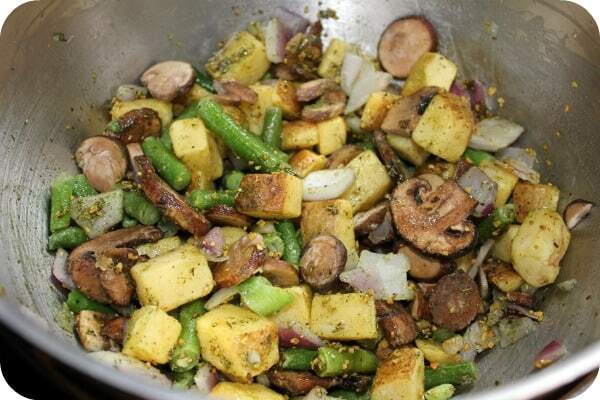 The first step was to add the frozen veggies & potatoes in a large bowl and mix with 2 tbsp. oil and the seasoning mix that comes in the package. Right away I could smell the fragrant aroma of the spices and it made my stomach growl. Then just place the mixture on a baking sheet in one single layer and bake in a 400 F oven for 20 to 25 minutes. Make sure to turn the medley half way through cooking time so it will bake more evenly. I made sure to set my timer on my oven for 12 minutes so I wouldn’t forget to turn the veggies at half time. They turned out perfectly! I served it with some chicken breasts and it was sooooo yummy! The spices were not overpowering and really enhanced the individual flavours of the vegetables. My kids gave their approval too and said it was “really good mom”. I can’t get over how simple it was to make and you can bet we will be buying more of McCain Harvest Splendour Medleys. I’m looking forward to giving the other three varieties a try! 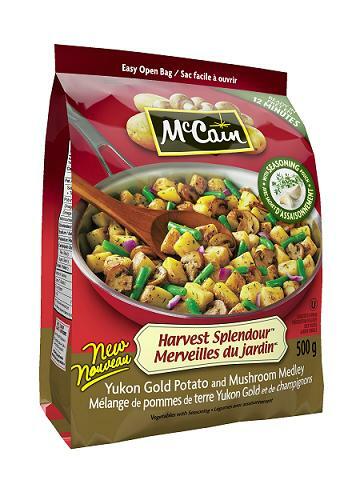 McCain® Harvest Splendour™ Medleys are now available in the frozen vegetable section nationwide at most major grocery chains for an average retail price of $3.79-$3.99 each (retailer may sell for less). For more information, visit www.harvestsplendour.ca or visit our Facebook page at www.facebook.com/mccaincanada. Disclosure: This post was brought to you by McCain via Glam Media Canada. The opinions expressed herein are those of the author and are not indicative of the opinions or positions of McCain. Dude, you made me drool over veggies. I want some, they look delicious! Wow that medley looks delicious, I see mushrooms and potatoes..can’t go wrong with that! This would be good for a brunch with omlette too..and yes Im hungry. i’ve never heard of this line of food. i’ll be on the lookout for sure on my next grocery store trip! i agree with the above comment, would be great for a weekend brunch! yum! I like this line of McCain : easy and so tasty. 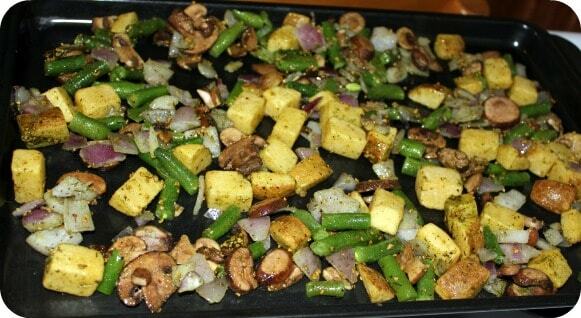 I use a lot of frozen veggies in my cooking: it saves a lot of time and money: vegetables are not perished. I was a little hungry before I read this and now I am VERY hungry! I haven’t seen a lot of these that include the mushrooms and I love mushrooms. Thanks for sharing this, I will definitely be looking for these at the store. THis looks amazing! I am not much of a vegetable person but this makes me want to start! I haven’t seen these yet, but it looks good! my husband and I tried the Yukon Gold mix and thought it was awful! !